This is the English version of Piratenbucht, very nicely produced by Days of Wonder. This is the ULTIMATE Pirate game! Everything from improving your ship to burying treasure is here. Defeat other Pirates in battle for fame and dare to take on the Royal Navy or Legendary Pirates. Decision making leaves you many options each turn as you try and out-guess the intentions of your rivals. Earn the most fame and win the game. I played this game for the first time the other night. The components are great! At first it seemed to be a fairly simple, light-hearted adventure...halfway through the game I realized there's a lot more to this game than I thought! The bluffing aspect during the navigation phase keeps players suspicious as to the destination of their opponents and a good mix of deep strategy combined with the use of dice in battle maintain the fun and excitement. A great game with a theme that can be enjoyed by both family and friends. Break out your eye patch, sword and headwrap. You don't need 'em, but you just might want 'em when you play this game. Excellent theme, tremendous components, a lot of fun. 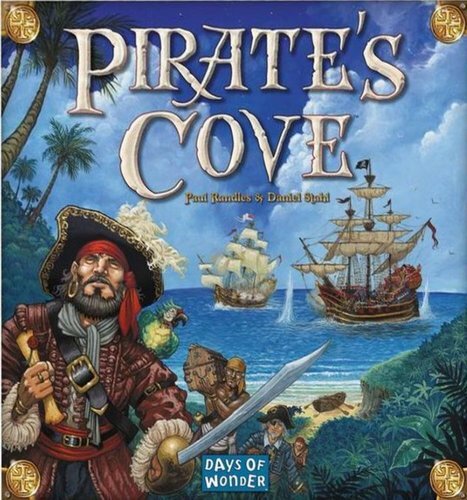 If you like pirates, you'll LOVE Pirate's Cove. If you don't like pirates . . . arrgh, c'mon, who doesn't like pirates? Ahoy Matey!!! Pirates are the big thing right now, and so is this game. You're always on the look out for your fellow gamers and their plots against you. Watch out for Black Beard, sometimes you forget where he's at, so beware!! Who doesn't love pirate games? In this game you build up your ship and use simultaneous selection to collect treasure and battle other pirates. Since this is a Days of Wonder game you know the components are going to be great. A fun game that scratches that pirate itch. Ooooh! What a competitive game! Be careful on this one! You really do get kind of angry when someone attacks you!! Yes, it is the luck of the roll of the dice, but I do not recommend playing this game unless you can keep your composure when you lose a battle! I think it is very fun... but only if you aren't playing with a jerk. Keep that in mind. Otherwise, it is really a neat game. This really is not a strategy game. If you realize that from the start, and you treat it as a fun thematic game, it is extremely enjoyable! As has already been mentioned: this is not a game that centers around combat. Instead, it is a game that focuses on trying to figure out the path-of-least-resistence towards ending up with more fame than anyone else. Note: when you play this game, I suggest that you play with the "parlay" variant which allows for bribing/bartering when you land at the same island as another player instead of having to force combat. It adds another layer of interactivity to the game that brings a lot to the overall experience. Good, light pirate fun. Dicefest, but theme carries it. Great gateway title. Pirate's Cove is a very thematic game with beautiful components. More importantly, it is also a very fun game to play when you are in the mood for random, dice-rolling fun. I always feel that I've been part of a story when the game comes to an end, and we often find ourselves talking about what happened last time we played - a sign of a succesful immersive experience. A heavily themed pirate game, where you need to bluff your friends in order to collect the most treasure. Are you willing to take on the fabled pirates or just take out your friends. Plays better with more people.